ROANOKE, Va - Showers that were around early Saturday morning will taper off through the morning. Sunshine will break free for the afternoon as a strong, Arctic cold front delivers the coldest air of the season to date later tonight through Monday. Expect gusty northwest winds to develop later this afternoon and overnight along with the potential for accumulating mountain snow. Increasing sunshine. Becoming breezy with highs in the mid-60s. 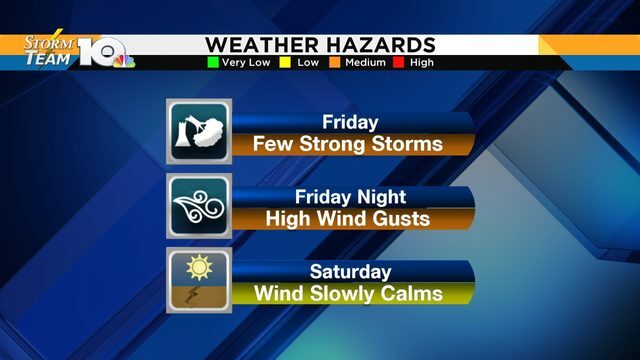 Winds could gust more than 45 mph at times through Sunday morning. Gusts could top 50 mph in the higher elevations. 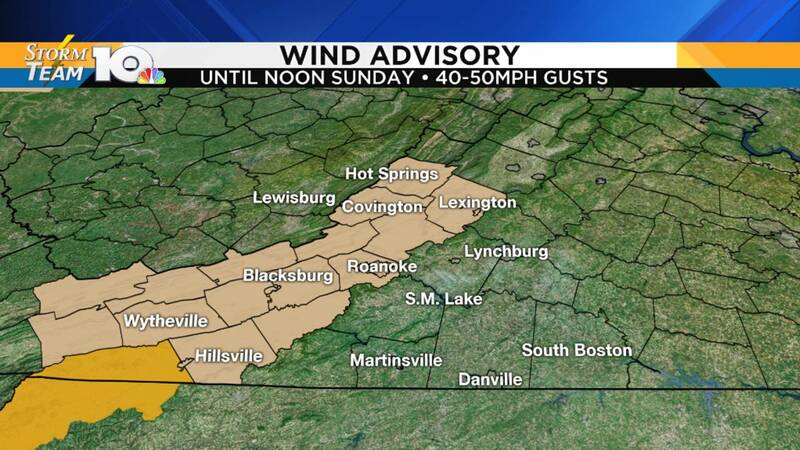 A Wind Advisory is in effect until Noon Sunday along and west of I-81. A High Wind Warning is in effect for Grayson County. Gusts could top 55mph. Use caution if driving high profile vehicles late Saturday through Sunday afternoon. Rain will change to snow as colder air rushes in late tonight. 1-3" of snow will be possible in Ski Country, on the western slopes of Pocahontas and Greenbrier counties. A few light snow showers may sneak into the Highlands, Mountain Empire and New River Valley early Sunday morning, but little to no accumulation is expected. Temperatures in the Mountain Empire are expected to flirt with the freezing mark by Sunday morning. A Freeze Warning is in effect.